You’ll be so pleased once you start making your own mayonnaise—the base of numerous French sauces. Photo © Diana Strizhigotskaya | Fotolia. This is the third page of a three-page article. Click on the black links below to visit other pages. Bring 1 cup of water to a boil in a small saucepan. Add the spinach and shallots or onions, and boil for 2 minutes. Then add the rest of the ingredients and boil 1 minute more. Strain, run cold water over the herbs and pat dry with a towel. 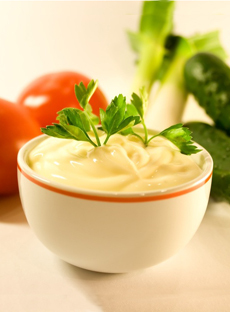 Stir the herbs into the finished mayonnaise. Add 3 to 4 tablespoons of fresh, minced green herbs such as tarragon, basil, chervil, chives, parsley or oregano. Add 2 tablespoons each of minced anchovies, capers and sour pickles to ½ cup softened butter or cream cheese. Beat the mixture, a tablespoon at a time, into the green mayonnaise. This easy blender mayonnaise recipe also can be made with electric beaters. 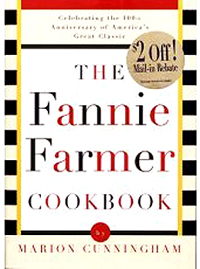 This recipe is from The Fannie Farmer Cookbook. Recipes © copyright their respective owners. Additional material Lifestyle Direct, Inc. All rights reserved.